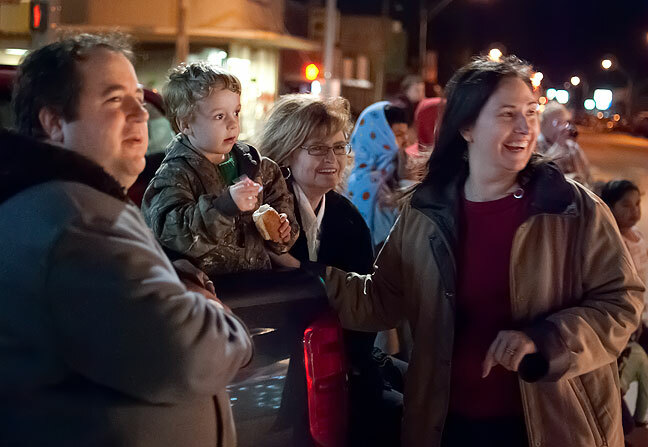 Tom, Paul, Abby and Chele watch tonight’s 26th Annual Pat Taylor Memorial Parade of Lights. 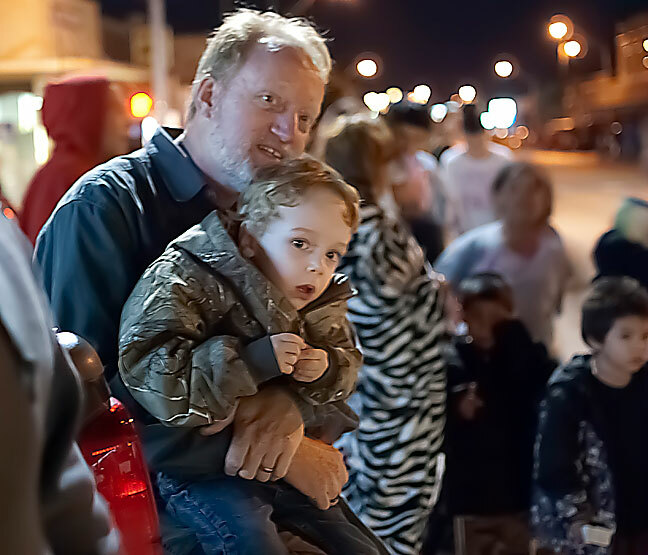 I have covered the Annual Pat Taylor Memorial Parade of Lights in Ada as a news photographer since 1988. Tonight was the first time I have ever attended it as, for lack of a better term, a civilian. Because the parade was postponed two weeks due to an ice storm, it fell on a vacation day during which Abby and I are hosting Abby’s daughter Chele, her husband Tom, and their son Paul. 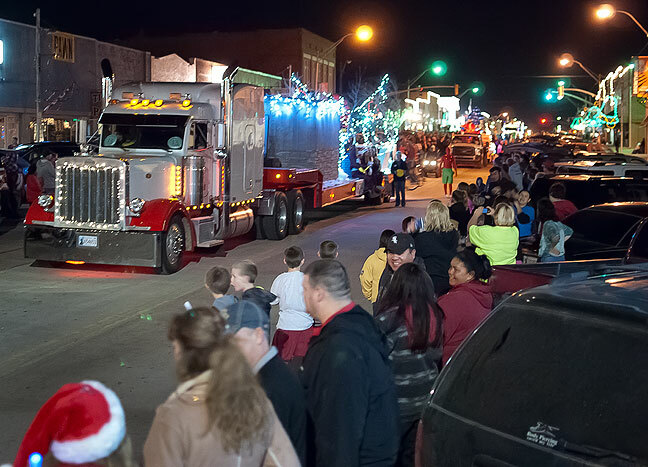 The 26th Annual Pat Taylor Memorial Parade of Lights marches down Main Street tonight. We started the evening with dinner downtown at Papa Gjorgjo, the restaurant where Abby and I had our first date almost 11 years ago. Since we parked downtown, after dinner we were already on the parade route, so we opened the tailgate on Abby’s pickup to create front row seats. Paul, who is about to turn three, was mesmerized by the whole thing, which was the first parade he ever saw. He sat in Abby’s lap for a while, but when she said she was getting tied from holding him, we switched places, and I handed Abby my camera. She shot really well. It was one of the warmest nights I can remember for the parade. Everyone had a great time. Abby made this image of me holding Paul at tonight’s parade. His jacket is a Christmas present from us. Glad you guys had fun. I do know what a huge difference it is to attend such events without any job requirements. I remember the first few times I attended a high school football game without being ‘on the job’ after several years of covering them. Very different. Caption: Top and bottom pictures – Family Bliss! Smurfiest of holidays to the whole family! I think that first picture is one of the most beautiful of Abby I’ve ever seen — and that’s saying a lot. And that last one with you and Paul…I’m verklempt.